When I have a bad, or stressful day, or when I have an especially good day, I like to treat myself. In the case of this recipe I was having a bad day. It was the last day of a rather bad week, actually and I was in need of something really evil to sooth my nerves. 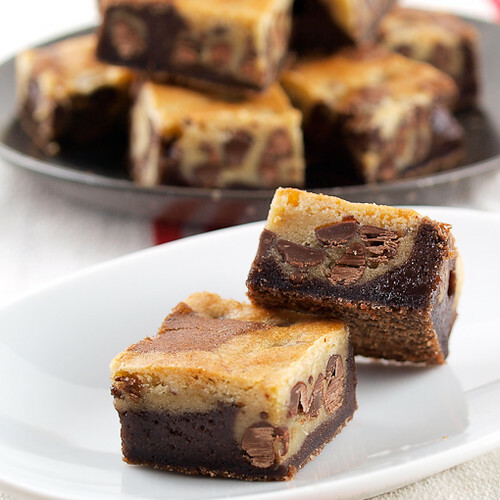 This recipe was inspired by a brownie that I saw in a coffee shop a few months ago. It was a walnut brownie with a walnut chocolate chip cookie baked in the center and it sort of looked like danish. 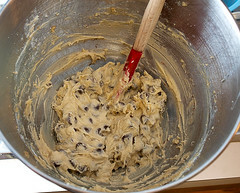 As I am not a big fan of walnuts I passed, but the idea of it, the baking of cookies in brownie batter, stuck with me. I think it is safe to say these little bars made everything all better. 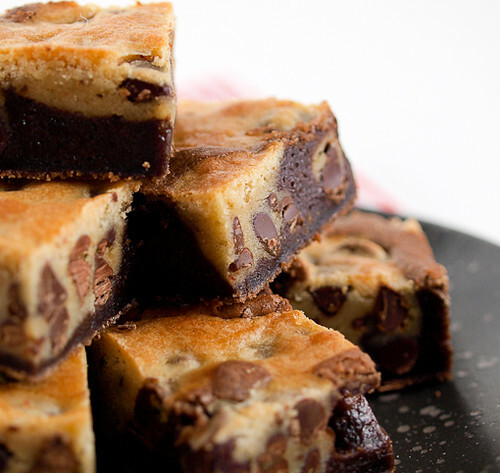 These bars are sort of a marbled amalgamation of chewy brownies and buttery cookies. 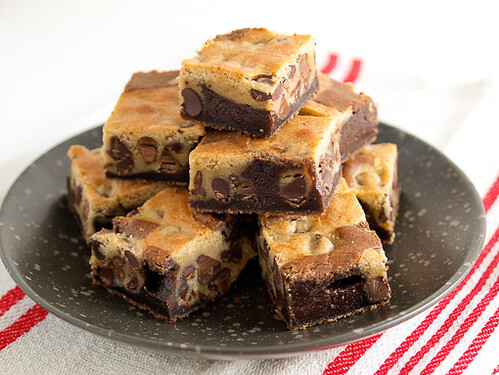 Since these bars are not well structured, I just put scoops of cookie dough into the brownie batter with wild abandon, you tend to get a little of both the brownie and cookie in each bite. I opted to skip nuts, since I just do not like them in cookies or brownies, but some toasted pecans, walnuts, or almonds can be added if you like it nutty. Since I like really chewy brownies and cookies I did not cook these until they were firm in the center. 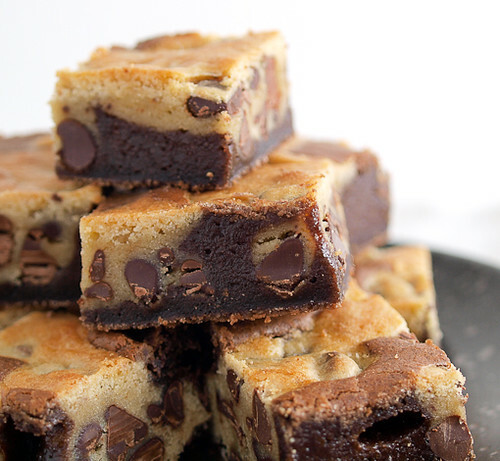 If you are not into really chewy, gooey brownies, or you prefer you brownies more done in general, add 3 to 5 more minutes to the cooking time. These are over the top when they are still just slightly warn, but I also like them cold. Served cold these would also make a good summer time treat. Heat the oven to 350F. 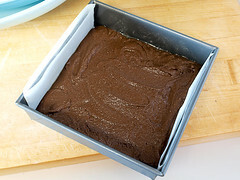 Spray an 8×8-inch square baking pan with non-stick spray, line the pan with parchment paper, then spray the paper with non-stick spray. 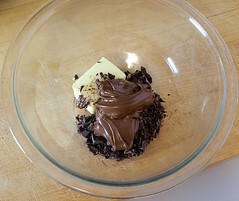 In a small bowl combine the butter, chopped chocolate, and Nutella. 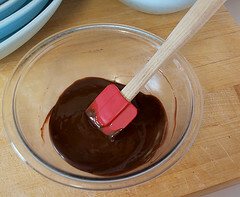 Melt in the microwave, or in a double boiler, until smooth. Set aside to cool. 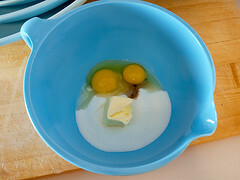 In a medium bowl combine the second amount of butter, sugar, egg, egg yolk, and vanilla until smooth. 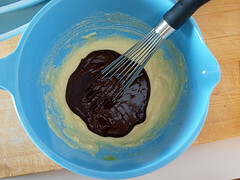 Add the melted chocolate mixture and whisk to combine. Sift in the flour, cardamom, cocoa powder, and salt. 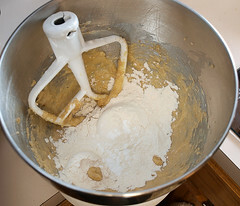 Whisk until no large lumps of flour remain then spread it evenly in the prepared pan. Set aside. 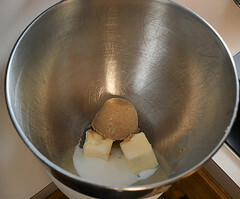 In a separate bowl cream together the butter, brown sugar and sugar until creamy and smooth. 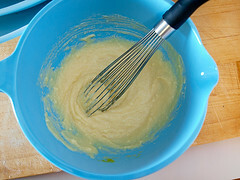 Add the egg and vanilla and mix until blended. 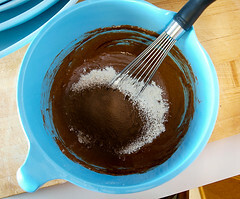 Sift in the flour, baking soda, and salt and mix until most of the flour is incorporated. Add the chips and mix until evenly distributed. 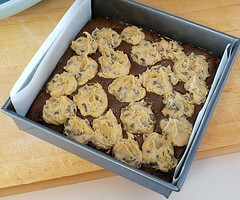 Scoop the cookie dough into the brownie batter then bake for 25 to 30 minutes, or until the edges are just set and the center does not wobble when the pan is shaken. Cool in the pan for one hour, then remove from the pan and cool to room temperature before slicing.